Carson argues that the message of the cross must shape all our ministry. We forget it is the power of God and maybe think it “foolishness.” We turn to strategic planning instead. This book is a wise exposition of the passages and contains many challenges for Christian leaders. Paul resolved to know nothing except Christ and him crucified. What would our ministries look like if Christ crucified was at the very center? Would musicians really be sneaking their way back up to the stage during the after sermon prayer if we valued Christ crucified more than smooth performance? Other challenges include what it really means to be spiritual. Do leaders see it as their passion to bring people to consistent Christian living in light of the gospel of the crucified Christ? (Loc 1790/2270) Do we understand the serious nature of Christian leaders being entrusted with the gospel and that “all their service turns on making that gospel known and encouraging the people of God, by word, example, and discipline, to live it out”? (Loc 1492/2270) Do preachers remind us we are called to suffer or allow us to be comfortable in our lifestyle? This book is a good wake up call to Christian leaders. Carson writes that “Christian leaders dare not overlook their responsibility to lead the people of God in living that is in conformity with the gospel.” (Loc 1790/2270) It is an awesome responsibility to have been entrusted with the secret things of God. I recommend this book to Christian leaders who desire to see their ministry centered in the gospel. You will be reminded of the serious nature of your call. You will be challenged to evaluate your ministry in light of Paul's words in 1 Corinthians. Carson has provided questions for review and reflections so this book could be used for a church board study or in a small group. Donald A. Carson (PhD, University of Cambridge) is research professor of New Testament at Trinity Evangelical Divinity School in Deerfield, Illinois, and is the author or editor of more than fifty books. He is one of the founders of The Gospel Coalition and an active guest lecturer in academic and church settings around the world. Going through this world in relationship with other people inevitably creates connections in our inner being called soul ties. When these relationships are loving, supportive, and nurturing, positive soul ties are created. But if the relationships become abusive or manipulative, or cause rejection, they can create a toxic brokenness within the soul that we carry with us, even long after the relationship ends. If these toxic inner soul ties are not broken, we will experience failure, fractured relationships, and even health problems throughout life. In Breaking Toxic Soul Ties, Tom Brown describes his own story of rejection and the process of inner healing he experienced. He helps you to identify and diagnose toxic relationships as he breaks down the difference between positive and negative soul ties. He also shows why toxic soul ties develop and how they can only be broken by a process of inner healing through confession, forgiveness, and prayer. The truth is, unless your self-image is firmly rooted in the truth of your identity in Christ, you will always be susceptible to bad soul ties. Tom Brown describes the way for you to move forward in life and leave pain and brokenness behind for good! This book is filled with spiritual insights. Brown draws on Scripture and personal stories to help readers identify toxic relationships, understand why they are drawn to them, and ultimately be healed from the experiences. I have read a few books on this topic and this one is right up there at the top. It is written in a way that is easy to understand and has biblical information I've never read before. For example, David might have been an illegitimate son of Jesse. That would explain much of his behavior as well as some of Psalm 51. Brown has a good explanation of 1 John 2:2, that Jesus died for the effects of others' sin on us as believers. He has good insight on why, in the story of the woman caught in adultery, the man was not accused. Brown also has many insights into why we behave as we do. I really appreciated his insights into the kinds of experiences we might have had that lead to our desiring harmful relationships. He helps readers identify the various forms of manipulation and how to recognize proper authority. How to be healed from toxic relationships is also included in the book. I liked his teaching on inner healing. He has good information on dealing with feelings of guilt or rejection. And he ends his book with a very good section on establishing a proper self-image in Christ. I recommend this book to those looking for a very understandable and practical book on toxic relationships. Tom Brown is best known for his deliverance ministry. Millions have seen him on ABC’s 20/20, as well as on MSNBC and the History Channel. He is a noted conference speaker, prolific author, and committed pastor. His award-winning Internet site, www.tbm.org, reaches more than a million people a year. His books published by Whitaker House are Devil, Demons, and Spiritual Warfare; Breaking Curses, Experiencing Healing; Prayers That Get Results; and Spiritual Gifts for Spiritual Warfare. Tom is the founder and pastor of Word of Life Church in El Paso, Texas. You can find out more at https://tbm.org/. Democracies die. We might think that a coup and violence is required to destroy a democracy. But some democracies die at the hands of elected officials who take subtle steps to authoritarianism. Is American democracy vulnerable? To answer that question, the authors look back in history and examine the demise of democracies. We can learn lessons from events in other countries. We can spot the warning signs. We can also identify what citizens did to prevent the loss of democracy. The warning signs are there. Attacking the press and accusing them of lying and presenting false news. Threatening one's opponent with jail. Lying to the public. Marginalizing the other branches of government. Denying the legitimacy of an election. Is American democracy in danger? The authors are concerned. They present possible futures, depending on whether political gate keepers do their job and whether the norms of mutual tolerance and forbearance are restored. We may very well see a future with greater polarization in politics and among citizens. We may even experience a future event that provides an occasion for the president to demand greater powers. I highly recommend this book. It is a good exploration of what brings about the death of democracies. It is a good evaluation of the events that have led us to this place in our American history. It is a very good wake up call for us all, reminding us how fragile our democracy is. Steven Levitsky and Daniel Ziblatt are professors of government at Harvard University. Levitisky's research focuses on Latin America and the developing world. Ziblatt studies Europe from the nineteenth century to the present. Both have authored previous books and have written for various publications. Rubart is an author who crafts fiction that I know will make me think. He has done that well in this novel. I was challenged to think deeply about spiritual transformation, about being a new creation in Christ, about how that truly comes to be. The first half of the book moved a little slowly for me. Toren was a football player, let go by the Seahawks for his uncontrolled anger. He wakes up in a hotel room and ultimately realizes he has been missing for eight months. His wife and children, as well as everyone else, thought he was dead. His wife, tired of his angry outbursts anyway, has moved on. Toren struggles to find out where he has been and why his new found control over his temper seems to be fading. He wonders if he will ever be able to win back the love of his wife and children. A number of thought provoking issues are covered in this book. One is our memories. Are they reliable? Do they change? I was fascinated by the reported work of scientists and their experiments to get rid of unwanted memories, such as those experienced by people with PTSD. By far the most important issue is dealing with our dark side. Rubart mentions the familiar story of the two dogs within, one white one black. The one fed the most becomes more powerful. Yet a Christian is a new creation in Christ. What about that dark side? What about the old man being put to death and Christ living within? Those are all issues Toren struggles to understand and have become a reality in his life. I recommend this novel to readers who enjoy a plot portraying the truths of spiritual transformation. You will be given much to think about. While the first part of the novel moved slowly and I felt the whole novel could have been more concise, it is definitely worth reading. Discussion Questions are included so this book would be a good choice for a reading group. I received a complimentary egalley of this book from the publishers. My comments are an independent and honest review. This novel combines mouth watering descriptions of food, adventures in the interesting city of Lyon, and a murder mystery. Laure is a food writer on assignment in Lyon, France. A beloved chef is found murdered and then another in the same way. As she interviews chefs and samples their masterpieces, she also gathers information to ultimately find the murderer. Lyon has been described as the gastronomic capital of France. That is why this venture through the food culture of that city is fun. Laure is writing an article on the bouchons in the region. They are restaurants in Lyon that serve traditional Lyonnaise cuisine. They were usually started by women but were now owned by men. Some use local produce while others offer unusual parts of animals. I mean, calf's head with ravigote sauce? Poaching chicken in a pig's bladder? Many of the restaurants mentioned in the book actually exist. Details on the foods served and cooking techniques come from the authors having interviewed the chefs. Besides the many delicious, if unusual, foods is the mystery. It is sort of in the background until near the end of the book. I was surprised at the clues that led Laure to identify the murderer. Those clues were components of foods. That's unusual but perfect for this novel. I recommend this book to food lovers and mystery lovers alike. You'll enjoy a journey through the very interesting restaurants and foods of Lyon. You'll learn about the origin of the bouchons as well as the labyrinth of privates passages in the city that date back to the Renaissance. Written in French, the translation is great. The novel is a mouth watering one. Noel Balen, writer and musician, has over thirty mysteries to his name, including the Winemaker Detective series, a hit cozy mystery and TV series. Hi co-author and wife Vanessa Barrott is a corporate lawyer with a passion for gastronomy and family roots in the Parisian restaurant scene. Translator Anne Trager founded Le French Book as an expression of her ongoing passion for France and crime fiction. She adapted this mystery into English with the help of award-winning editor Amy Richards. Le French Books, 160 pages. Most Christians don't give much thought to keeping Sabbath. It is one of the Ten Commandments. We certainly would not kill or covet, but keep the Sabbath? Swoboda reminds us it is a gift from God. Receiving a gift is one thing but knowing how to use it properly is something else. I am impressed with Swoboda's heart felt desire to see Christians keep Sabbath. It is a holy time, he says, and it reminds us that all time is God's. The Sabbath rest was experienced in Eden before the Fall so it is not part of the curse. God created Adam and Eve to need a day of rest, even in their perfect state. Swoboda's is a convincing argument. His theology is sound. I like it when I see a business closed on Sunday. Because Swoboda is a pastor, they keep Sabbath on Wednesday. Each Christian would need to determine how and when to keep Sabbath but this book gives a solid foundation and many good ideas. Swoboda's writing style is academic. This would be a good book for pastors and teachers. I am not sure the average layman would appreciate the extensive theological discussion the book contains. There are Questions for Reflection included at the end of each chapter. This book could be used as a small group study for thinking Christians. A J Swoboda (PhD, University of Birmingham) pastors Theophilus Church in urban Portland, Oregon. He is executive director of the Seminary Stewardship Alliance and teaches biblical studies, theology and church history at Portland Seminary and Fuller Theological Seminary. He is the award-winning author or editor of nine books and speaks regularly at conferences, retreats, churches, and seminars. You can find out more at http://ajswoboda.com/. I enjoyed this unusual police procedure novel. The plot combined a cold case investigation with current events revealing additional yet puzzling information. Winslow uses the creative technique of multiple narrators. I was surprised at how well this moved the plot forward. I have to admit that I did forget sometimes who was narrating and that added a bit of confusion to an already very complex plot. I really appreciated the good balance of character development and investigative technique. Some of the character interaction was based on previous novels but this one did read well on its own. I recommend this mystery to readers who enjoy thinking through a complex plot in which some suspects present lies and some of the evidence seems contradictory. This little book is a spiritual gold mine. I have read more books on The Lord's Prayer than I can count yet I was inspired and informed by this one. Mohler takes about the first third of the book to explain in depth why we need this example of prayer. It shows the kind of prayer God desires. It corrects our natural errors and bad habits in prayer. The rest of the book is a very good commentary on the prayer, phrase by phrase. As Mohler writes, “...each petition is a theology lesson in itself.” (Loc 1429/1534) He has done an excellent job of explaining the theology to us as well as the impact on our daily Christian life. He shows how our prayers reveal our personal theology. They show what we think of God and ourselves and how we think God relates to us. Our prayers reveal our priorities and our assumptions. We know we are to be a praying people. Mohler writes, “There is no true intimacy with God without prayer.” (Loc 409/1534) But we need instruction on how to do it. Mohler informs us what each phrase reveals and what it means to us in our daily life. I highly recommend this book to any Christian who wants to understand the value of prayer and become one who prays better. R. Albert Mohler Jr. is president of the Southern Baptist Theological Seminary and the Joseph Emerson Brown Professor of Christian Theology. He can be heard on his daily podcast, The Briefing, where he analyzes news and events from a Christian worldview. He also writes popular commentary at https://albertmohler.com/. He and his family live in Louisville, Kentucky. I enjoyed this novel of FBI procedure, suspense, and a hint of romance. While it is the second in the White Knights series and there are some allusions to events in the previous novel, this one read well on its own. The White Knights is a special task force of the FBI. Rick is a ballistics and weapons expert and our hero. When some experimental, self-steering bullets are stolen and used to kill, the task force is called in. Rick meets Olivia, the psychologist treating the ex-military victim. Tiny sparks of romance between them pop up from time to time as Rick and the task force work the case. This novel has a good balance of FBI procedure and character development. There is a lot of cutting edge technology used by the task force. I was amazed at all of the information that can be gleaned from DNA, such as age (a four year margin), hair color, race, etc. The task force has an expert hacker and others that are experts at gathering information too. As for the character development, Rick has been alienated from his parents so there is some character work in that area. I don't like it when an agent allows romantic feelings for a woman he's investigating or protecting, as is the case here. At one point, Rick's concentration suffers as “...his worrying about Olivia left him unable to focus...” (281) Rick had been a sniper in the marines and I would have appreciated his character much more if he had disciplined his feelings for Olivia while working the case. Perhaps a female author writing a lead male character made him just a little too emotional. In some respects I felt Olivia was a much stronger character than Rick. I did enjoy the novel, however, and do recommend it to those who like reading about cutting edge FBI investigative techniques. There is some suspense included as well as romance. Susan Sleeman is a bestselling and award winning author of more than 25 inspirational romantic suspense novels. She hosts the popular website http://www.thesuspensezone.com/. She and her husband live in Oregon. You can find out more at https://www.susansleeman.com/. The more I read of Hoffeditz's experiences, the more I was convinced he did not have the “gift” of singleness. He wrote this book over ten years ago, when he was single, but is now married with two children. There is some good, general teaching in this book. For example, he writes of trying to fill up the void in his life with accomplishments. He writes about trusting God in adverse circumstances and seeing opportunities to recognize God's presence and provision. He has a good section on temptation. He uses the stories of biblical characters to illustrate his teaching. These general instructions apply equally well to married Christians as well as singles. Hoffeditz identifies the purpose of this book “is to take a fresh look at exactly what the Scriptures says about singleness.” (10) He does that within the context of his own dissatisfaction with being single. A Christian who truly has God's gift of singleness may well be frustrated with this book, as I was. A Christian who is single but really wants to be married will better appreciate this book and will be able to identify, I am sure, with the discontent expressed with being single. David M. Hoffeditz is cofounder and director of Ancient Tours, which leads several trips a year to biblical lands, and president of Iron-2-Iron Ministries. He also teaches part time at Trinity Evangelical Divinity School. I enjoyed this book. It was rather well written and the characters developed pretty well. My favorite was Cassie, a precocious eleven year old. She might have been a little too precocious as I am not sure an eleven year old would be as mature as she was. The novel is long. I would have preferred that some of the scenes not essential to the plot had been cut. Unfortunately, I understand this is the sequel to a book that has yet to be published. The motive for the kidnapper stems from that yet unpublished prequel. I found that to be confusing. Not understanding the motive of the kidnapper just made the book less enjoyable for me than it could have been. I do recommend this novel to readers who enjoy a legal thriller and don't mind not exactly knowing why the nefarious character does what he does. "THE AMENDMENT KILLER is tense, timely, and terrific!" 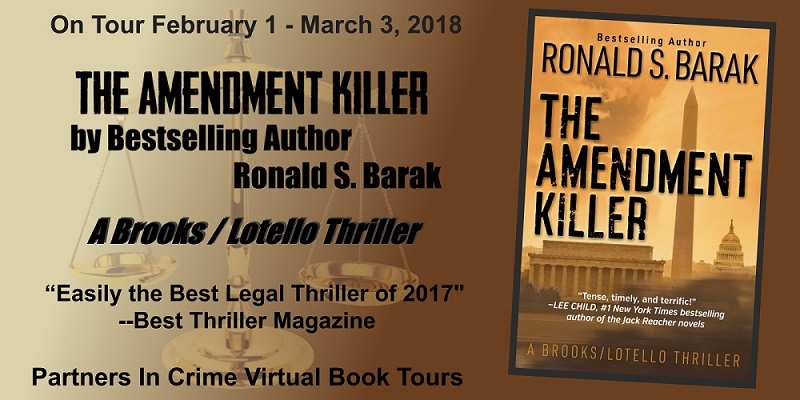 "With an unparalleled sense of terror forewarned on the opening page, Ron Barak's THE AMENDMENT KILLER is a high-speed, tense political thriller about one of today's most fundamental issues, the integrity of our Supreme Court." "THE AMENDMENT KILLER is a high concept, hybrid blend of a political, psychological and action thriller all rolled into a smooth, savory, and suspenseful mix. Ron Barak manages to channel the best of John Grisham, David Baldacci and even Steve Berry in this amazingly timely tale cast with a Supreme Court backdrop. As prescient as it is thought-provoking and as much fun as it is factual, this is reading entertainment of the highest order. I'd be shocked if this book doesn't become a bestseller." "From its electrifying opening line to its powerful conclusion, THE AMENDMENT KILLER is a ripped from tomorrow's headlines story of law and politics set against the backdrop of the Supreme Court. But more so, it's a story about the lengths we will go for the ones we love. Timely, fast-paced, and heartfelt, you'll mourn the turning of the last page. Ron Barak is a writer to watch." 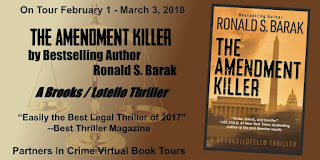 "Ron Barak’s THE AMENDMENT KILLER is easily the best high stakes legal thriller we’ve read in 2017." Plus Add it to Your Goodreads List! Don't miss your chance to grab a copy of The Amendment Killer during these two great sales! The Kindle eBook will be $1.99 February 22-28, 2018.